The signs were all there the night before. A rain in the evening after many weeks of dry weather that led to traffic gridlocks all over the place. We were rooted to our spot on the road for 45 minutes before anyone gets to moved an inch. What originally was a 30-minute car ride, was blown into almost an hour-and-a-half. By midnight, the rain escalated into a storm complete with the occasional lightning. It was all quiet by morning. So quiet that I was awakened by the silence at 5am in the morning. Perhaps the cold lulled everyone into hibernating deep sleep. The air was clean and crisp when I stepped out of the house. A rare occasion in this smog-filled land of TaoBao. 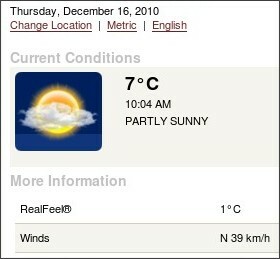 The outdoor temperature was 7 degrees Celsius but factoring wind chill, it was 1 degree. A big change from a comfy 21 degrees just the day earlier. Not exactly my favourite temperature right now as it means I'd be forced to put on a jacket. My comfort zone is between 15 to 25 where I can continue to wear my short-sleeves and stay dry all the time. The temperature is expecting rise up to 10 degrees Celsius (RealFeel: 5 degrees) and I wonder how I am going to go for my P230 run in this climate. I may have to switch to t-shirt instead of my usual tanktop. Running Shorts still? Definitely, I wouldn't trade it for trackpants. They are going to be way too hot when you get into the zone. Glad this cold snap is temporary as temperature is expected to hit 16 degrees tomorrow and return to the 20s by Sunday.